The nominations for the 27th Annual GLAAD Media Awards were announced today, highlighting many of the films the Academy overlooked this year when it came to Oscar nominations. 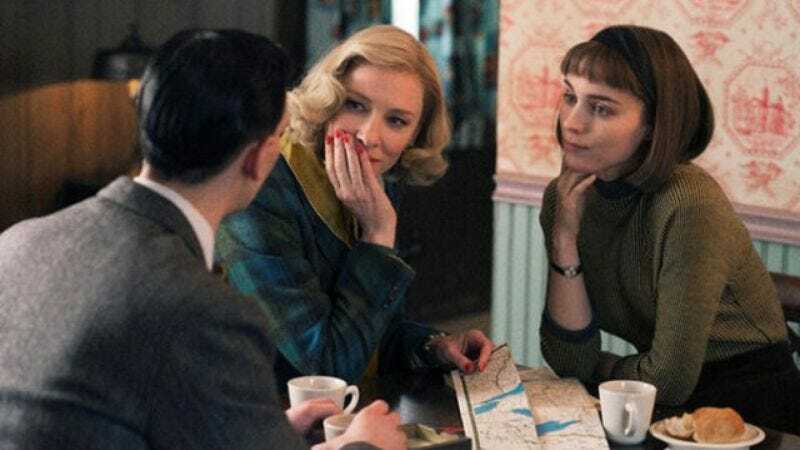 Despite being one of the best-reviewed movies of the year, Carol was under-represented in this year’s Oscar nominations, but that doesn’t come as a surprise given the Academy’s long-standing pattern of excluding queer cinema. Ian McKellen recently took shots at the Academy for failing to recognize queer films, and according to Mic, of the 78 films nominated for Best Picture since 2007, only 5 percent have featured a queer or trans protagonist. The GLAAD Media Awards, on the other hand, specifically “recognize and honor media for their fair, accurate and inclusive representations of the lesbian, gay, bisexual and transgender community and the issues that affect their lives.” So in the nominations list, you’ll find several of the titles the Academy couldn’t be bothered with. Carol was nominated for Outstanding Wide Release Film, along with Dope, The Danish Girl, Freeheld, and Grandma. For Outstanding Limited Release Film, 52 Tuesdays, Appropriate Behavior, Boy Meets Girl, Drunktown’s Finest, and Tangerine were nominated. Over on the television side of things, Grey’s Anatomy was nominated for Best Drama Series for the first time since 2010. It’s joined by fellow Shondaland series How To Get Away With Murder, which won Best Drama in 2015 and increased its representation of queer people and storylines this season by introducing Eve (Famke Janssen), Annalise Keating’s ex-girlfriend. The rest of the film and television nominees are listed below.